Mondrianâ€™s unique grid builder gives you ultimate control over the layout of your website. Show posts, portfolio and shop items, team members and more â€“ or get fancy with your custom content! Big shop or small â€“ we got you covered. Built with web shops in mind, Mondrian comes bundled with numerous professionally designed styles and layouts that will help your sales soar. Multiple post overlay options to choose from, 800+ fonts and gorgeous post layouts make Mondrian a great choice for a modern blog or magazine. – Pre-designed landing page templates that come bundled with Mondrian enable you to create a perfect landing page for your product or service. Not only does Mondrian come bundled with the powerful Visual Composer plugin â€“ you also get 12 unique widgets, including custom Slider and Counter, Testimonials, and more! Built with creatives, agencies and freelancers in mind, Mondrian comes with a number of layouts, features and options specifically created to showcase your services and grow your creative business. Intuitiveness and ease-of-use are main principles on which both Mondrian and WordPress itself are based. Mondrianâ€™s admin interface is not only full-featured and powerful, but also intuitively understandable and easy to use. With over 800 Google fonts to choose from, Mondrian lets you quickly find the perfect combination of typefaces for your website or shop. A plethora of pre-designed pages and layouts that comes with Mondrian enables you to create a professional looking website in no time. No coding skills? No problem. 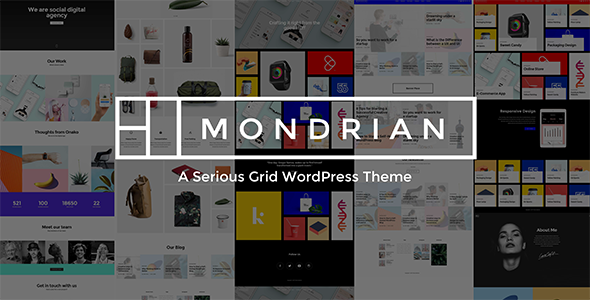 Inspired by itâ€™s namesake, Mondrian WordPress Theme presents a pure visual experience â€“ and that extends to visual tools that let you create stunning websites even if you donâ€™t know the difference between braces and brackets. 10+ navigation menu layouts to choose from and play with â€“ including height, positioning, boxed or fullwidth, and more! Mondrian comes with a dead simple one-click demo content importer, saving your time and effort and letting you focus on things that truly matter. Mondrian comes bundled with three unique widgets you wonâ€™t find anywhere else â€“ the author widget, recent posts with images widget, and a social sharing widget that supports every social network you can think off! custom built for the purpose. WPML is the de-facto standard for building and running multilingual sites, and Mondrian is fully WPML compatible and tested.